I had been praying for help to not just lose weight, but to also be free from the addiction of food. All of my life I’ve fought this addiction. I was raised in a family who fought this addiction continually. Growing up, I had friends who also fought this addiction. There have been many things in my life that I have purposely missed because of my weight. Many years ago, I asked Dr. Beth to come to our church to teach us how to be healthy. I followed all of her instructions for several months, lost weight, and then returned to gain it all back and more. I watched my daughters fighting this same addiction and I prayed all the more to be free, once and for all. 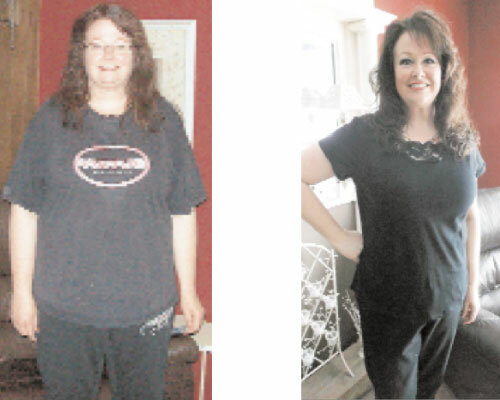 In June 2012, I started working closely with Dr. Beth to lose weight and get healthy. She put me on a product called Avilean. Because I knew I could trust her, I jumped in with both feet, all of my heart, knowing this was the answer the Lord had given me. What better timing than two days before our two week camping vacation too. I bought all the usual junk food for camping—chips, dips, treats, and pop. Then I also bought some fruit and veggies and water bottles. I remember my daughter and I at McDonalds hiding a baggie of ground flax seed and taking a few pinches to put into our oatmeal. Our picnic table would be covered with lettuce, fruit, veggies, nuts, and water bottles. When we got home from vacation, we had lost several pounds and were on our way to changing our lives forever! My whole family got on board and we’ve never looked back! I’ve tried every diet and every pill and spent hundreds of dollars, but nothing has worked as well as taking Avilean. The addiction is complete- ly gone—I’m free! I started out feeling like I had moved to a foreign coun- try and couldn’t understand the language, but Dr. Beth taught me during each consultation we had. She promised me that my taste buds would change and healthy foods would start to taste better and she was right. I can’t even imagine eating like we use to—all of the harmful foods we use to eat! My jeans are a size 12 and they are beginning to be too big. If someone were to ask me, “what is the most important thing needed to start living healthy?” I’d have to say—to humble yourself. If you’re not humble you won’t listen, you won’t believe what you’re told, and you won’t do what you’re told—you’ll continue to think you know better. And that is the bottom line with addictions. We are continuing to grow and learn as we watch Dr. Beth’s “Recipe’s for Life” TV programs. I’m so thankful for all Dr. Beth has done in my life and in my family.